Commissioned to create a theatrical response to the Ferguson event, actor and playwright Dael Orlandersmith spoke with scores of St. Louis-area residents — across racial, cultural and class lines. The result: a solo show that paints a potent portrait of a community rocked by rage and sorrow. 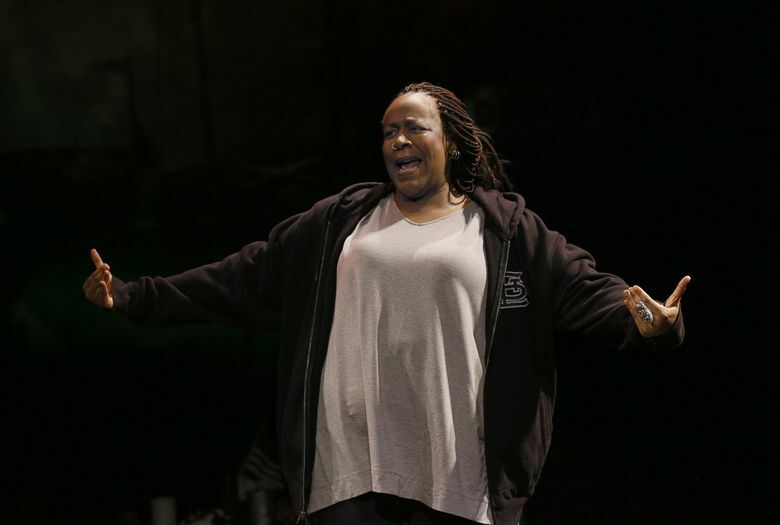 Dael Orlandersmith is one of those actors who pulls you in close wherever she performs. 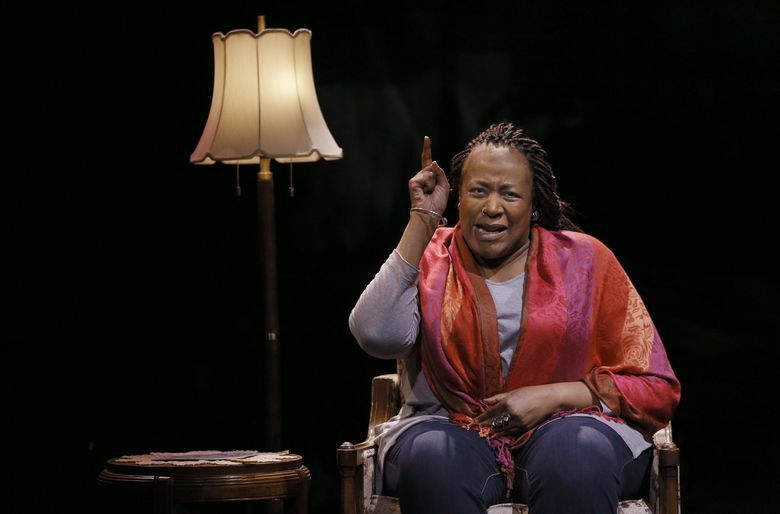 At ACT Theatre, Orlandersmith’s searing solo piece “Until the Flood” is staged in the in-the-round Allen Theatre, which furthers the intimacy between performer and audience. Ringed by Takeshi Kata’s design of clusters of stuffed toys, flowers, candles and other familiar tributes to the young dead, it’s a good place for holding that conversation — the one about race. 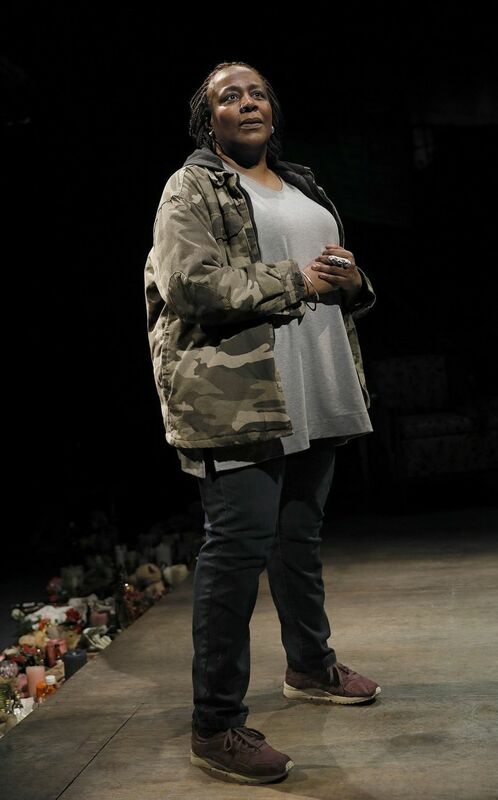 From the first words she utters as Louisa, a black retired teacher still absorbing and reeling from the seismic event that hit her town of Ferguson, Missouri, this noteworthy actor-writer makes us feel like she is talking directly, openly, intently to each audience member. Despite an avalanche of news reports, a grand jury hearing and a $1.5 million wrongful-death settlement, Louisa doesn’t have firm answers any more than the rest of us do. But the incident sparked weeks of protests and racial unrest, and for Louisa a sense of déjà vu — back to the civil-rights tumult she witnessed in the 1960s. Back to when there were “sundown towns” in the area, where blacks risked their lives if they showed up at night. Anyone who thinks as a country we’ve transcended racial differences will get an argument from most of the eight characters Orlandersmith portrays, in this semi-fictionalized study of a community near St. Louis rocked by rage and sorrow. 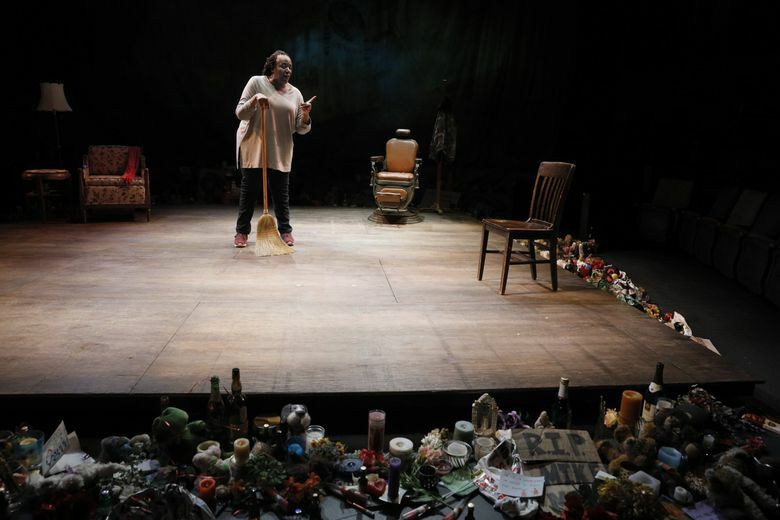 Commissioned by the nearby St. Louis Repertory Theatre to create a theatrical response to the Ferguson event, the New York-based Orlandersmith (who has previously performed at ACT in other magnetic original solo pieces) spoke with scores of St. Louis area residents — across racial, cultural and class lines. But she and her astute director, Neel Keller, weren’t assembling an oral-history docudrama in the manner of Anna Deavere Smith, whose “Fires in the Mirror” and other solo works have also examined tumultuous, often racially charged public events from different perspectives. Unlike Smith, Orlandersmith does not name those she interviewed in the play, nor quote them verbatim. Nor does she physically mimic them. Her fictionalized, intensely personalized approach has risks. If you walk into “Until the Flood” knowing little to nothing about what happened in Ferguson, and its national wake-up-call impact, the 70-minute piece will not fill in many blanks. The upside of Orlandersmith’s technique? It potently delivers the raw essence of the composite characters she has juxtaposed. With a shift of voice and posture, a change of outer garments, she exudes the fear and fatalism of black youths who were Brown’s peers. One is Hassan, a free-styling rapper haunted by the specter of police violence. And we learn from Louisa how the history of segregation in the area, of “restricted” neighborhoods that barred Jews and blacks, leaves a long shadow of bigotry that fair housing laws have not dispelled. Saddest perhaps is the lament of Connie, a white schoolteacher who becomes friends with a black woman through their visits to a local wine bar — only to alienate her with an unintentionally insensitive remark about the Brown case. It’s poignant to see how, for all her good intentions, Connie can’t comprehend her America is profoundly different from that of her black friend. “Until the Flood” (the title comes from the show’s many images of water, and the fluidity of art and history) offers no solutions to heal this rift, no pieties about everyone just getting along. It just pierces through the media noise and fog of assumptions with straight talk from hearts and minds. Since Brown’s shooting, there have been so many other hotly contested killings of young black men (and women) by the police, including in Seattle. So many unanswered questions, so much grief. “Until the Flood,” by Dael Orlandersmith. Through July 8; ACT Theatre, 700 Union St., Seattle; tickets start at $20; 206-292-7676, acttheatre.org.